Danny Willett’s grip may rival those of Ryan Palmer, Bubba Watson and Mikko Ilonen as the strongest in golf. 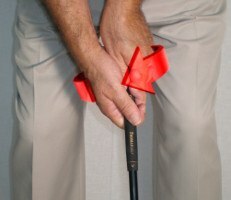 In fact, it would be difficult to turn one’s left hand any father right and still swing effectively. A veteran pro from England with a pair of European Tour wins to his credit (as of February 2015), Willett is hardly a household name. He is, however, a solid all-around player whose methods merit study. Any analysis should start with Willett’s grip. Setting up to the ball, the back of Willett’s left hand is practically on top of the club’s handle. In fact, all four top knuckles are easily visible in a face-on view. His right hand, likewise, is rotated well to his right so that the wrist bows slightly outward at the joint. This is a power-hitter’s grip, and Willett is certainly long: He averaged 296 yards per drive in 2014. Yet he’s also reasonably accurate, especially on approach shots. In other words, it’s possible to hit the ball straight with a super-strong grip. 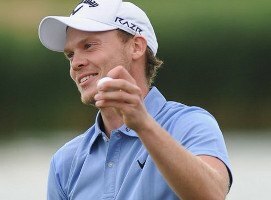 On the greens, Danny Willett’s grip has varied between a cross handed style and an unconventional triple overlap. What’s a triple overlap? Essentially, it’s a homemade method where Willett places the middle, ring and little fingers of his right hand over the corresponding digits on his left. 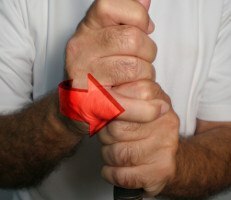 The idea is to unite the hands and eliminate as much wrist movement as possible. 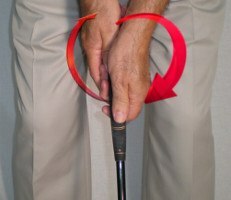 Ryan Moore employs a similar putting grip, but with only two fingers overlapping.